Even though the weather would have you think it is still summer, we are already weeks into fall and on our merry way to winter. Despite the heat, I'm in full blown "soup mode" and am looking for any excuse to whip some up. To convince myself it is really fall, I made a sweet potato stew packed full of autumn flavor. With juicy pieces of beef steak and tender sweet potato, this hearty soup is sure to fill you up. A hint of chili for heat and undertones of cinnamon spice really can convince you there is a brisk chill outside. The longer you let this soup stew, the more developed and delicious the flavors. I recommend at least four hours in the slow cooker, but I've been known to make this stew and leave it roasting overnight, resulting in beef that practically melts in your mouth. Cut the steak into 1 inch cubes. Place the meat into the crock pot/slow cooker on high heat. Sprinkle the flour over the steak and stir to cover. Add the sweet potato, carrots, onion, tomatoes and peppers to the crock pot. Season with chili powder, garam masala, thyme, oregano, salt & pepper. Pour in the beef broth, chicken broth and garlic broth. Stir well to combine. Add the sprig of rosemary and bay leaves. Cook on HIGH for 3-4 hours OR low for 6-8 hours. 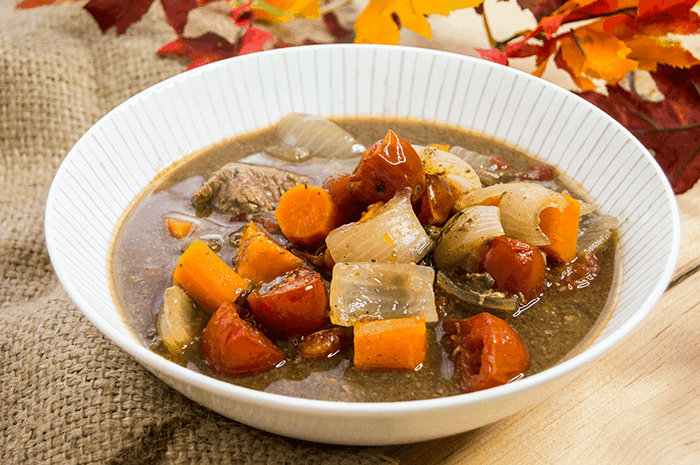 The stew can simmer on low for up to 12 hours for more developed flavors. Serve with a side of buttery corn bread and enjoy!